Hello Frndzzz.... www.dealsnloot.com Again Back With New FreeCharge Deal. FreeCharge is back with new offer. Now get 100% cashback for free. This offer is valid for new users. By using this trick you can still earn Rs 50 freecharge cash. 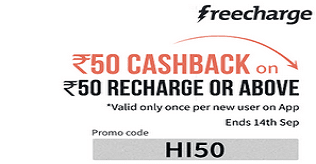 Also We Are Sharing 100% cashback Trick To Get Recharge For Unlimited Times. Initiate your Recharge and apply promo codes accordingly as listed below. Finally make a payment using Debit/Credit card/Netbanking. You will get Rs 50 in your wallet within 24Hrs. keep visit here for more stuffs like this. Offer is Vaid for new users.